Before I went vegan, spaghetti bolognese was a pretty regular option for me. It was pretty simple: red sauce, ground beef, pasta…done! Now that I don’t eat meat, I have found a way to recreate an old Italian favorite, but with even more flavor and much less cruelty. This is a good meal for mid-week dinners, especially in winter when you want nice, hot comfort food. We typically eat gluten free pasta, so this meal was made with gluten free spaghetti. Feel free to use your favorite type of spaghetti or pasta shape! When we made this dish, it was our first time using plant-based mince. We usually utilize tofu and manipulate it to taste like ground beef. This time, we thought we’d give the plant-based meat a try and we were pleasantly surprised. I’m definitely over wanting my food to taste like meat, but it still had a great flavor once it was all tossed together. It’s crazy how much the consistency really looked like ground beef mince. The talent these days! This dish is actually a pretty flexible one. You can toss in any veggies you like and it’ll usually meld with the Italian pasta sauce. It’s especially good when you get to the end of the week and you just want to finish off your veggie supply in the fridge. We used onions, mushrooms, peppers, and tomatoes, but you can also add eggplant, zucchini, carrots, spinach, kale…whatever! Play around with the veggie combos when you make it and see what you like best. If you’re a texture person, you’ll like some veg in there over others. Most people think kale is weird with its curly texture, but I absolutely love it. We’re big fans of spice in our house, so we add spice or hot sauce to everything. 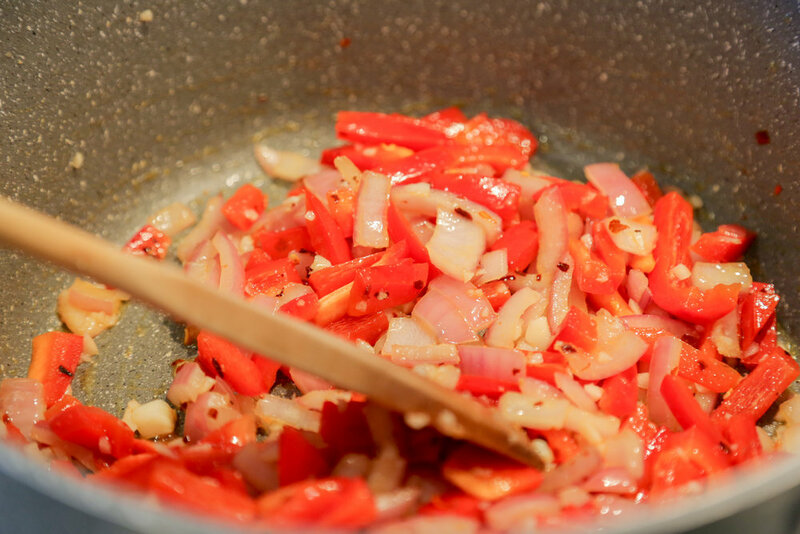 If you too are a fan of a good kick in the mouth when it comes to your food, add some chili flakes when you’re sautéing your onions and peppers. The spicy flavor will get in there early and make for a nice spice in the sauce that’ll make your tongue dance. As the sauce cooks and your house/apartment/flat/room starts smelling like a famous Italian kitchen, you can prepare yourself some garlic bread or pour a glass of wine. This is a comfort food dish after all, so treat yourself and enjoy the experience of it all. Cooking is one of the most rewarding processes, so be sure to taste as you go and be proud of your creation no matter how it turns out! Heat olive oil in a pot and add garlic & onion once hot. Sauté for 5 minutes until onions are translucent. 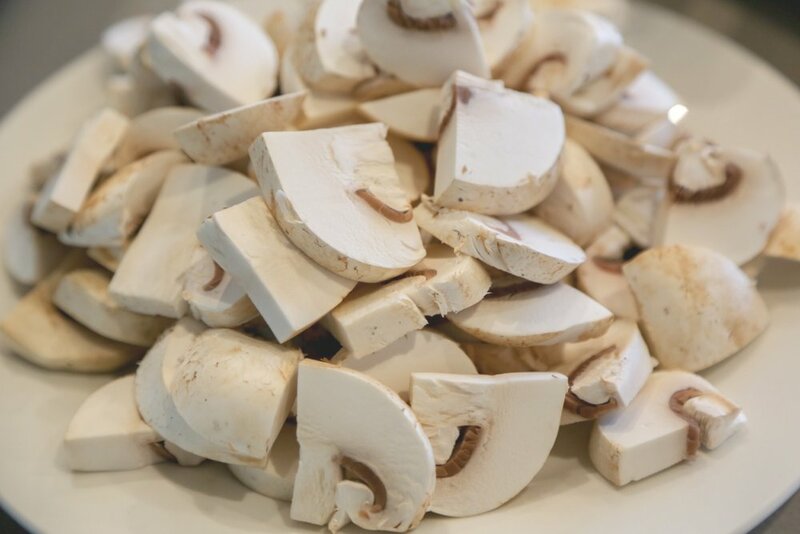 Add mushrooms & cook for another 5 minutes. Add mince and stir together until combined. Pour in red wine and allow it to cook off for about 5 minutes. Put a pot of water on the stove to boil for the pasta. Once red wine has absorbed, add tin of chopped tomatoes, spices, cacao powder, and tomato paste. Cover pot and cook for another 10 minutes. Add pasta to the pot with boiling water. Lower the heat and cook pasta until desired. Stir mince sauce frequently. Add S & P to taste. Drain pasta and add to serving bowls. Top pasta with sauce and garnish with basil.